In case of deep or puncture wounds, animal bites, or serious burns, consult a physician. Stop use and consult a physician if the condition persists or gets worse. Do not use if allergic to any ingredient listed on this label. Clean the affected area. Apply a small amount of this product (an amount equal to the surface area of the tip of a finger) on the area and rub gently using a cotton swab. If not completely rubbed in after a 20-second rub-in, too much product was used. Repeat the process three times daily. Keep this product refrigerated to preserve effectiveness and color. This product is an OTC antibiotic drug product for human use. Blended for typical skin color. May stain cloth. Water, glycerin, hydroxethylcellulose, chlor-hexidine gluconate, glucono delta lactone, methylparaben, sodium hydroxide, dipropylene glycol, dimethyl sulfoxide, sorbic acid, ascorbic acid, magnesium stearate, stearic acid. 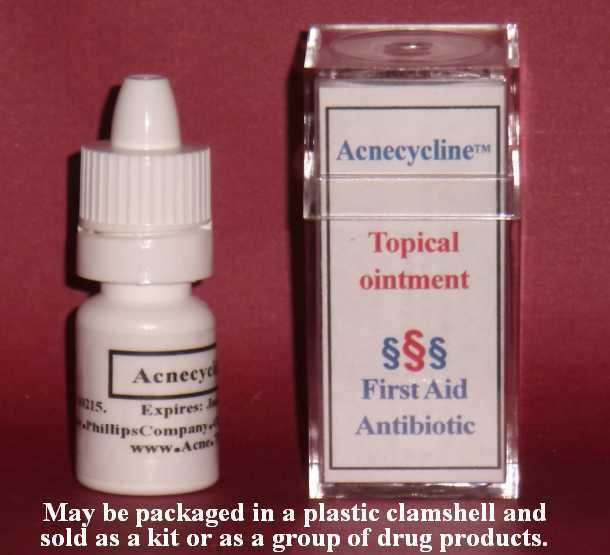 Same as other tetracycline products. Side effects: same as other tetracycline products. Clean the affected area. Apply a small amount of this product (an amount equal to the surface area of the tip of a finger) on the area and rub gently using a cotton swab. If not completely rubbed in after a 20-second rub-in, too much product was used. Repeat the process three times daily. For best results, refrigerate this product to reduce oxidation rate; to preserve effectiveness and color (normally orange). Discard this product if color turns black. Water, glycerin, hydroxethylcellulose, chlorhexidine gluconate, glucono delta lactone, methylparaben, sodium hydroxide, dipropylene glycol, dimethyl sulfoxide, sorbic acid, ascorbic acid, magnesium stearate, stearic acid, sodium bicarbonate.